Hiking in Nepal is one of the popular adventure trip in Nepal. Hiking in Nepal take to you different experience then Trekking in Nepal Himalaya. Hiking in Nepal is known as Nepal hiking offer unique travel experience of Nepal with beautiful Himalayan views of different trekking region, different life style of Nepalese people, mixed Nepalese culture , Temple and monasteries. Nepal has various hiking destination among the Nagarkot Hiking, Dhulikhel hiking, Kakani hiking, Phulchowki hiking, Nagarjun Hiking, Chovar hiking, Shivapuri hiking, Chandra giri hiking are most popular hiking in Nepal. Hike in Nepal take to you different experience of Nepal trekking and other package trip in Nepal. we have mentioned only few hiking area of Nepal but we Apex Nepal Adventure Pvt. Ltd arrange customized / personal Nepal Hiking trip as per traveler’s / hikers wish and holiday schedule.We arrange Nepal hiking trip after trekking in Nepal Himalaya , any other package trip or only Hiking trip in Nepal as per traveler’s holiday frame. Kakani is popular for panoramic mountains views of Annapurna (8091m/ 26,545ft), Manaslu (8165m/ 26,781ft), Ganesh Himal (7446m/ 24,422ft), Lantang lirung (7245m/ 23,763ft) and 20 other mountains over 6000 meters (19,680ft) above sea level. You can also see the natural beauty of the Kathmandu Valley, the people and their culture and traditions. This is a one day trip from Kathmandu. Nagarkot is situated east of the Kathmandu Valley at an elevation of about 1800 meters (5,904ft). This spot is popular for mountain views particularly at sunrise and sunset. Among the 25 mountains above 6000 meters (19,680ft), Annapurna (8091m/ 26,545ft), Manasalu (8165m/ 26,781ft), Ganesh Himal (7446m/ 24,422ft) and Lantang lirung (7245m/ 23,763ft) can be seen. This is also a one day trip from Kathmandu. It is one of the most prominent peak 2829m/ 9050ft. high, which surrounds the valley of Kathmandu. This mountain, as it’s name suggests ( Phul means flower in Nepali) is a natural garden of wild roses, yellow jasmine, iris and other native flowers. The summit is a rich grove of rhododendrons of various hues. A jeep able road leads to the top of the hill where there is a Buddhist shrine. A youthful hiker stands a good chance of scaling the peak in a little more than three hours. The place has all the makings of a peaceful resort area. It is about 10km/6.2 miles from Kathmandu city. There is a Buddhist shrine at the top, which is very holy for both Buddhist and Hindus. To reach the top one has to climb for about 15 to 20 minutes. From this point a panoramic view of the Himalaya ranges can be seen. 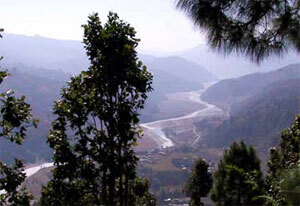 Dhulikhel is situated in the central part of Nepal. This is just 32 km from the Kathmandu valley. The main attractions of Dhulikhel are the grand and panoramic mountains views, numerous temples, and different types of landscape and a diversity of people. This ancient town is situated 30 km east of Kathmandu. It is a popular Himalayan viewpoint. From there you can have a complete panoramic view of the snowy ranges from Karyolung in the east to Himalchuli in the west. The old part of this town is an interesting area to wander around with some fine old Nepalese buildings and several interesting temples. From there you can also take a day trip to the Tibet border or Tatopani, a place which is famous for hot sulfur spring.